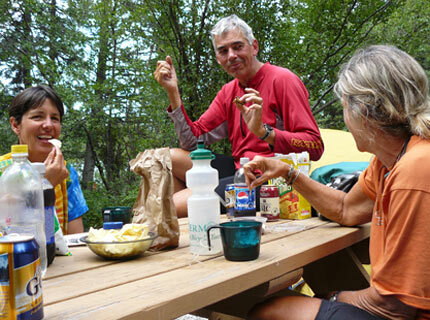 When we finished the descent from Logan Pass on the Going to the Sun Highway, we stayed at the Apgar Campground, still in Glacier National Park. We met up with Ray and Lydia, left, to celebrate. That is not coke in the coke bottle. Our campsite was on the shore of Lake MacDonald, shown below at sunset. 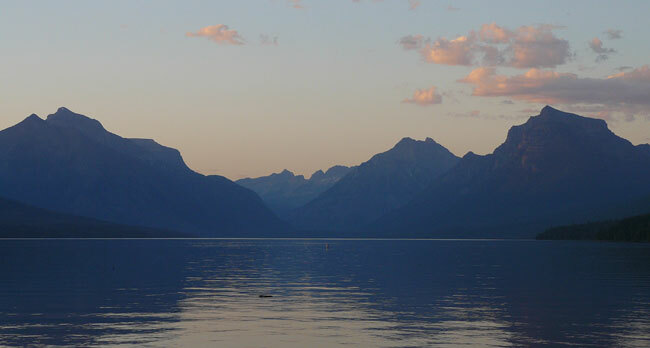 From Glacier Park, we cycled to Whitefish, Montana, while Ray and Lydia stayed at Glacier for a day of hiking. 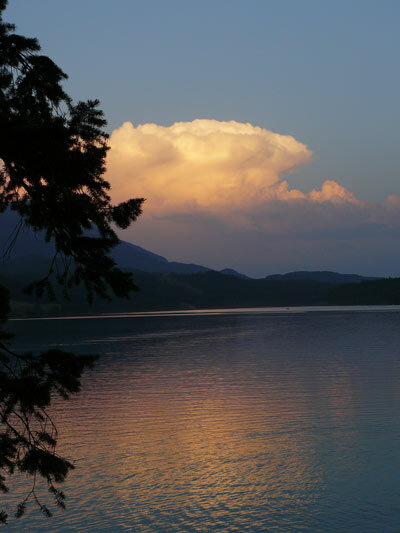 We stayed at a beauiful campsite on Whitefish Lake. It was spoiled by its proximity to a railroad track that carried freight trains all night. It was the only campsite we've ever visited that distributed free earplugs. Continuing north on Montana Route 93, we camped first at North Dickey Lake, left, near Fortine. We met up with Ray and Lydia again, and I had my first experience as stoker on a tandem. The rolling Montana countryside was gorgeous, though spoiled here and there by thoughtless over-development. 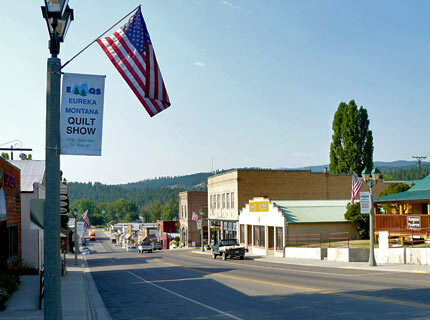 Somewhere between North Dickey Lake and Eureka, Montana, we stopped at a little grocery store, and to our astonishment we met Sonia Duveneck, daughter of good friends from South Strafford, whom we've known since she was little. She was with her boyfriend Jeremy (below left). Sonia was working in the nearby town of Eureka (below right). 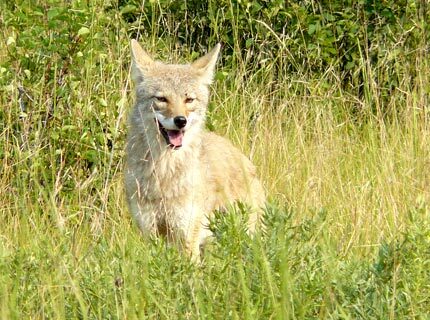 Jeremy worked for the Forest Service. When we crossed the border into British Columbia, there was more prosperous agriculture and less ugly development like that north of Eureka. However it was incredibly hot, and forest fires had created a smog in the air that accounts for the hazy view of the mountains. 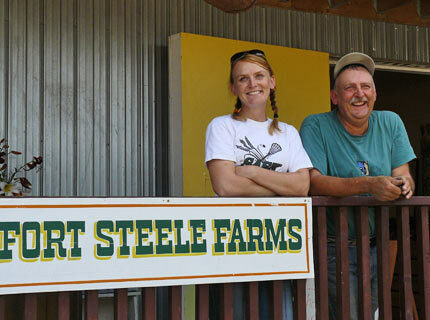 Not far north of the Montana Line, we visited with a farther and daughter at their farm store, below left. Route 93 into British Columbia follows the Kootenai valley, and there is a string of lakes along the way: Lake Koocanusa, Dickey Lake, Columbia Lake (headwater of the Columbia River) and Windermere lake. 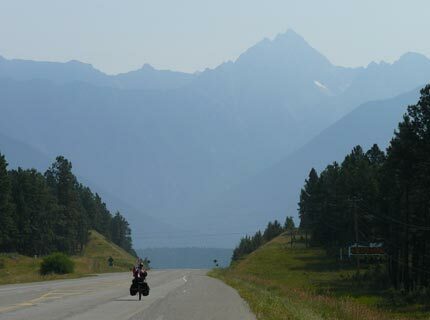 The ride continued to beautiful, but it stayed hot and hazy with smoke from the fires, below right. 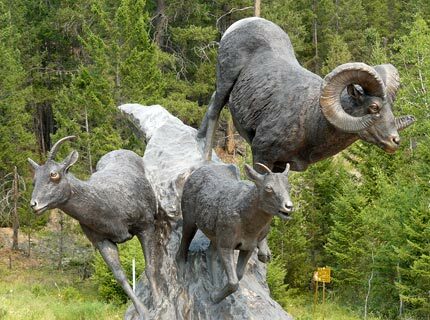 We saw occasional wildlife like the coyote below left, and also the remarkable sculpture of bighorn sheep, below right, at the Radium Hot Springs Visitor Center. 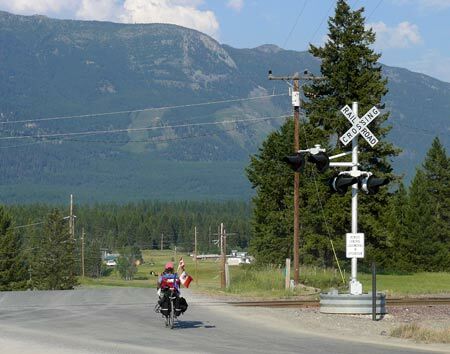 At Radium Hot Springs, we turned on Route 93 toward Banff, through Kootenai National Park. 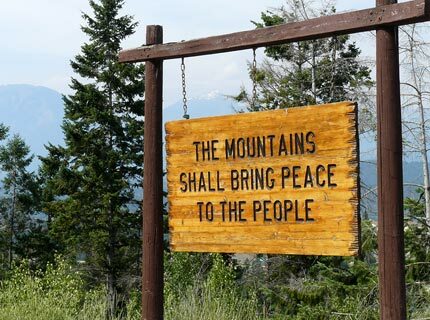 The sign below appears near the entrance to the national park. Unlike our previous trip, this time we had heavy cloud and occasional showers, right, but it was still beautiful. 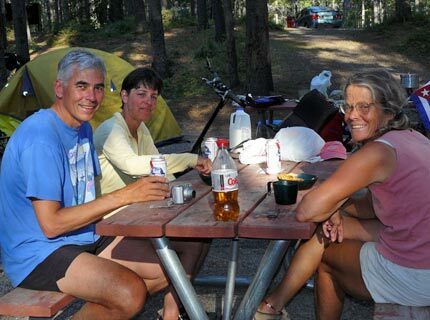 The weather cleared, and we stayed at a campsite beside the Kootenai River, left, where we met with Ray and Lydia again. Soon we would be in Banff. 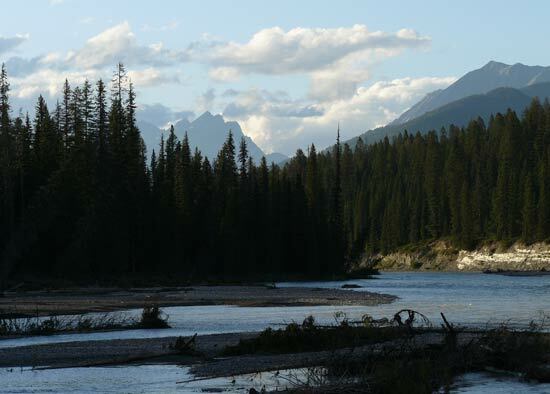 We took a couple of days to explore the Banff area, both on bikes and on foot. 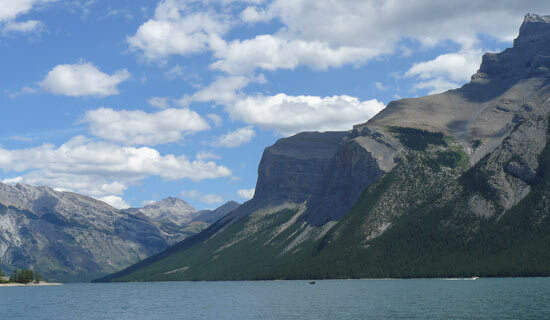 One day we went to Two Jack Lake and Lake Minnewanka, below left. While enjoying the lake, a new friend chewed on Barbara's sandals and tried to eat her kleenex, below right. Below left, our last evening on the road. The next morning, July 23rd, we were on our final ride, from Banff to Ray and Lydia's home in Calgary. 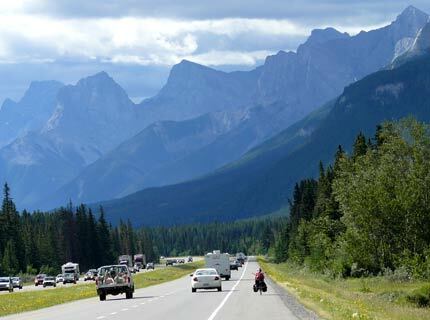 It's a good thing they showed us the way because the traffic near Calgary was heavy and the roads were confusing. But we made it safely and flew home the next day — eager to return to the mountains again.